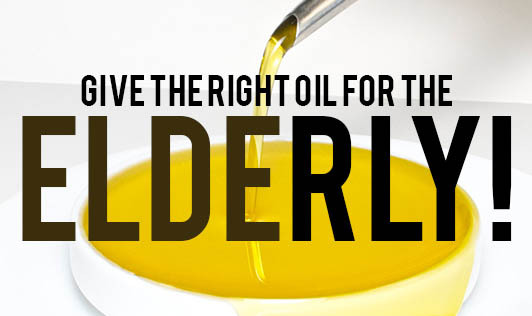 Give The Right Oil For The Elderly! Fat/Oil is an unavoidable ingredient while cooking. There are different types of fats- some good and some bad. During old age, it is important to use the right type of oil to manage, delay or stay away from diseases like cancer, heart diseases, diabetes, osteoporosis, dementia etc. Nutrient requirement changes with age; the same goes with fat requirements. Since calorie requirement is lesser in older people, the fat content of food is also to be reduced. Although the fat and energy content is reduced, the requirements of vitamins and minerals remain the same. In order to meet the fat soluble vitamin requirement in the elderly without increasing fat intake, oils fortified with vitamins A, D and E can be used. These fat soluble vitamins are required for the following reasons, and become extremely important at this age. • Vitamin A: It supports the immune system and is required to fight infection. It also helps to prevent cancer and keep the eyes healthy and skin young. • Vitamin D: Osteoporosis is common during old age, and the main reason for this is the deficiency of this vitamin. Eating appropriate amounts of calcium and vitamin D rich foods will prevent osteoporosis. • Vitamin E: It is a natural antioxidant and helps to fight against cancer and to boost immunity. Consumption of animal fats like butter and ghee should be reduced during old age. Use vegetable oils like sunflower oil, rice bran oil, groundnut oil etc. Use of hydrogenated oils like vanaspathi and dalda should be avoided as it can lead to heart diseases. So, don't eliminate the important oils from your diet, but make sure you use the right oil in the right amount!